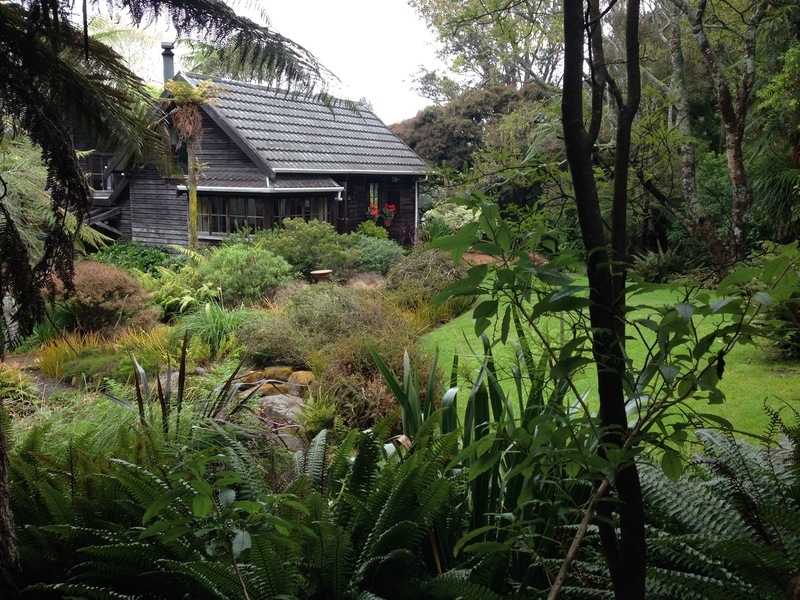 After a day of glorious sunshine exploring gardens full of vigorous perennials, brightly coloured roses and blossoming wisteria we arrived first thing the next (very wet) morning at Te Kainga Marire. My heart sank. 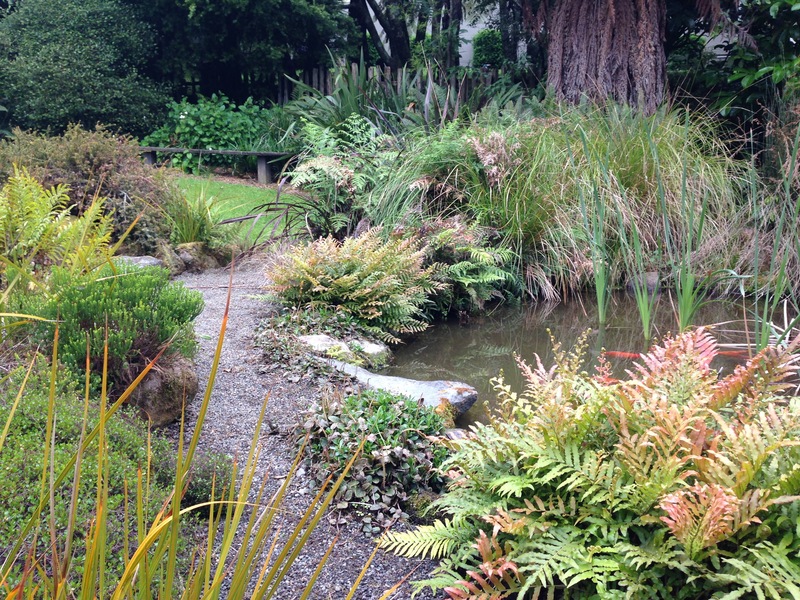 I had read glowing reports about this garden, but as we approached all I could see were a few drab natives. An hour later I had to be dragged away kicking and screaming, despite the fact that we had 4 more gardens and a 5 hour drive back to Wellington that day. I had found myself experiencing something quite out of this world and I didn’t want to ever leave. 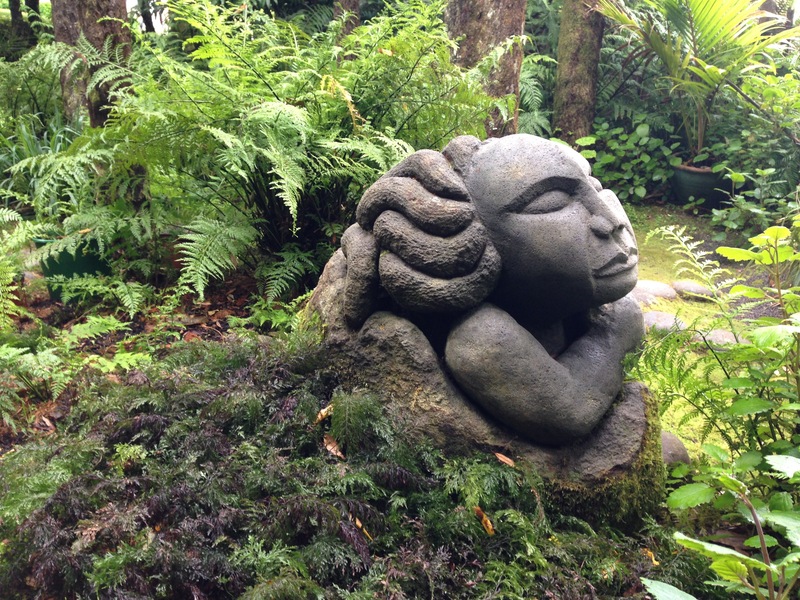 There were so many remarkable things about this garden that it is hard to know quite where to start. 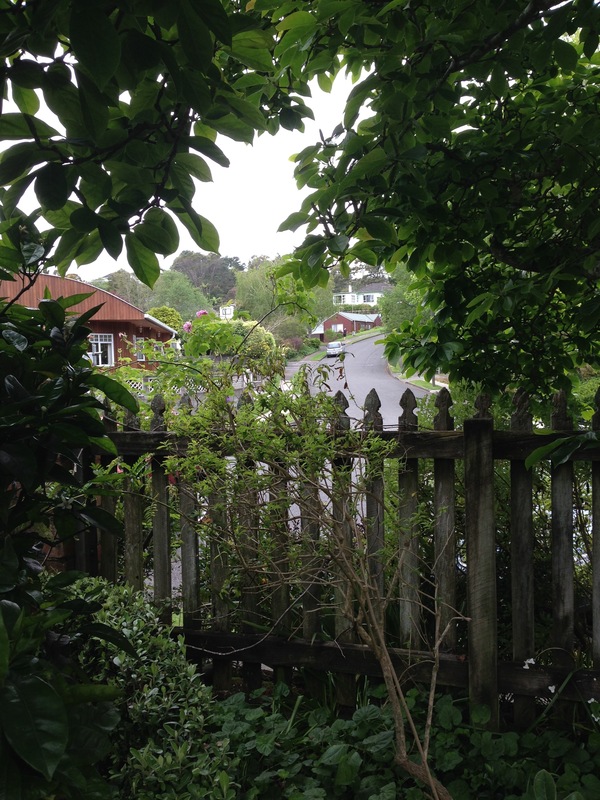 The ‘feel’ of the garden was totally unique – within seconds you are transported a million miles from the suburban street in which it is set. I felt like a child entering Disneyworld – open mouthed, intrigued, fascinated and completed hooked. It was like nothing else I had ever seen. 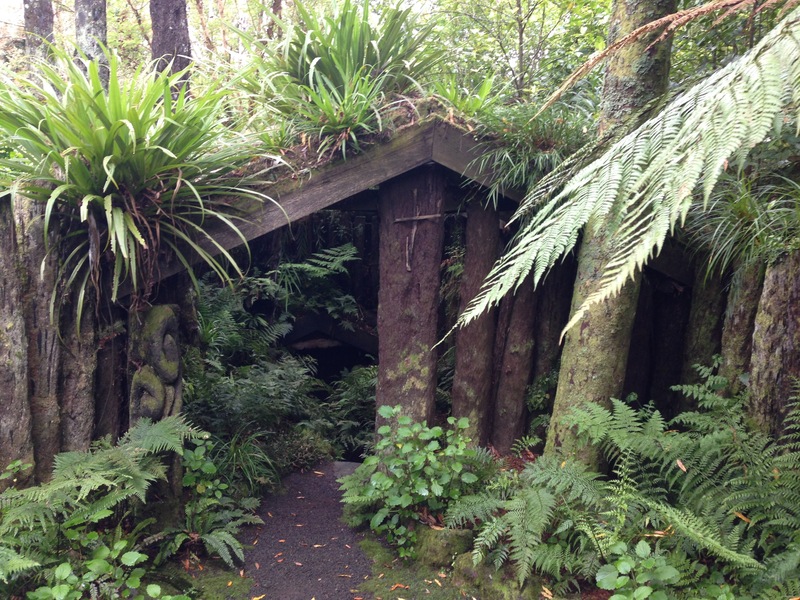 I walked by myself along the narrow mossy pathway around the edge of the property, ducking under low tree ferns, dodging plants growing out of the pathway and looking out for the birds I could hear. It was almost impossible to believe I was at 15 Spencer Place. On both sides were modern houses with small rectangular lawns and the odd Buxus hedge. ‘Te Kainga Marire’, Maori for ‘the peaceful encampment’, could not be a more apt name for this property. It felt as though you were in the remotest part of New Zealand in the most stunning bushland you had ever seen, completed enveloped by vegetation. Several gardens I have visited over the years have had the effect of transporting me away from reality to a whole new place. Without exception these have been large country gardens, where you quite literally are away from the rest of the world, lost in the depths of countryside and trees and flowers with not a car or building in sight. In contrast, Te Kainga Marire is just half an acre in size, located centrally in New Zealand’s 11th biggest city. The thing that really got me, was the realisation that it would actually be possible to create this effect in a quarter acre block. For this garden contained a large lawn, a vegetable, herb and cut flower garden, a citrus and apple orchard, a terrace, a large fish pond, various barbecue areas, statuary and ornaments, an underground glow worm tunnel (yes, really! 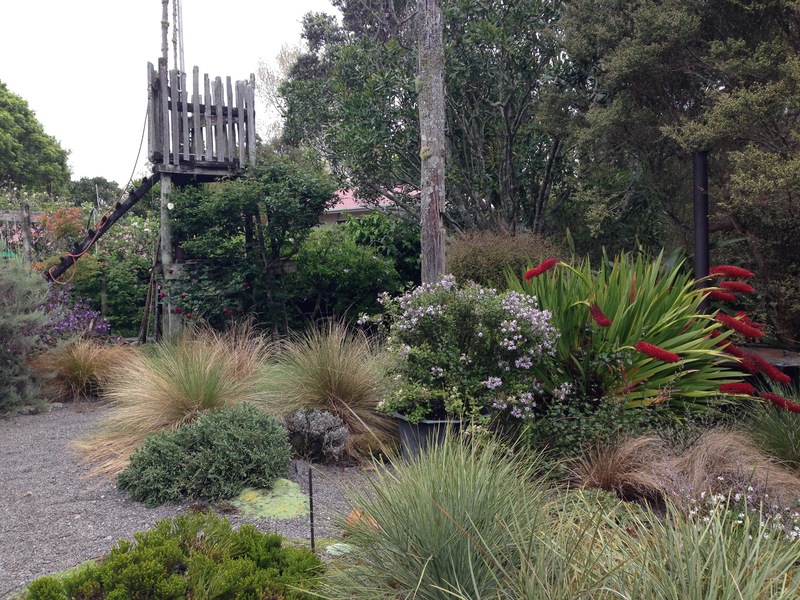 ), a tree fern glade, an alpine garden, a wetlands area, native grasses, numerous large trees, an outdoor bath, a children’s abandoned fort, not forgetting the four bedroom house with indoor cricket pitch. Take out half of these features and you would still have an extremely full and interesting garden. 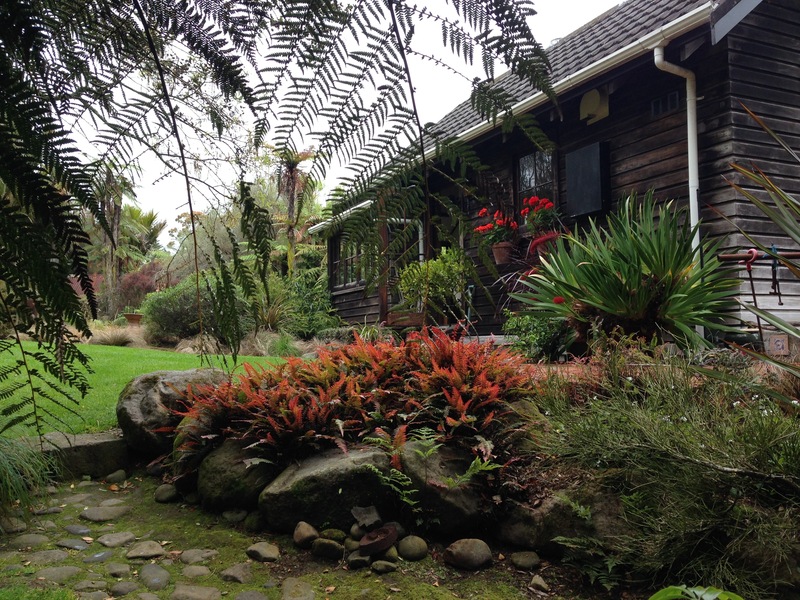 Valda Poletti and David Clarkson bought the sloping land in 1972 and have worked on the house and garden over 40 years. A garden like this simply can not be created instantly, as so many of us want. It has to age and mature and slowly gain its patina. Despite the owners starting with a plot of weedy blackberries, today each plant looks as though it seeded itself a hundred years ago and every square centimetre has something growing in it. 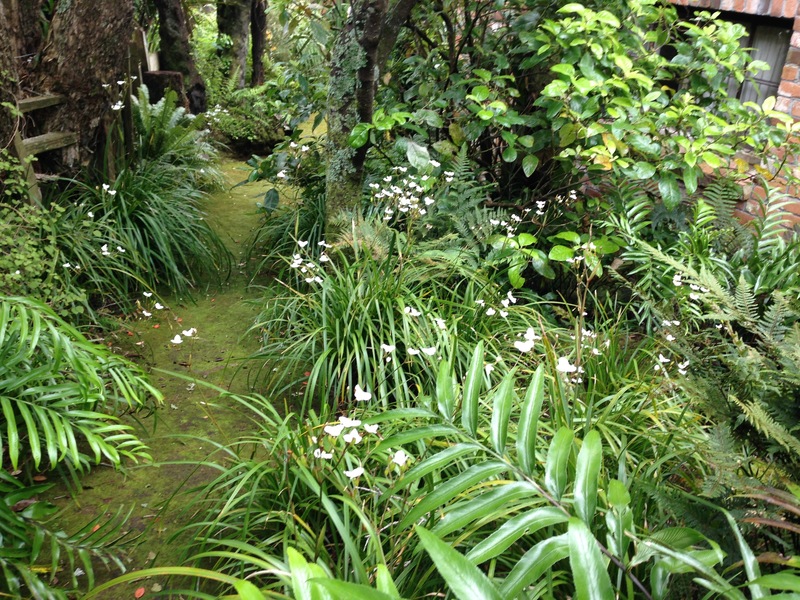 Even the pathways are covered in sumptuous green moss. 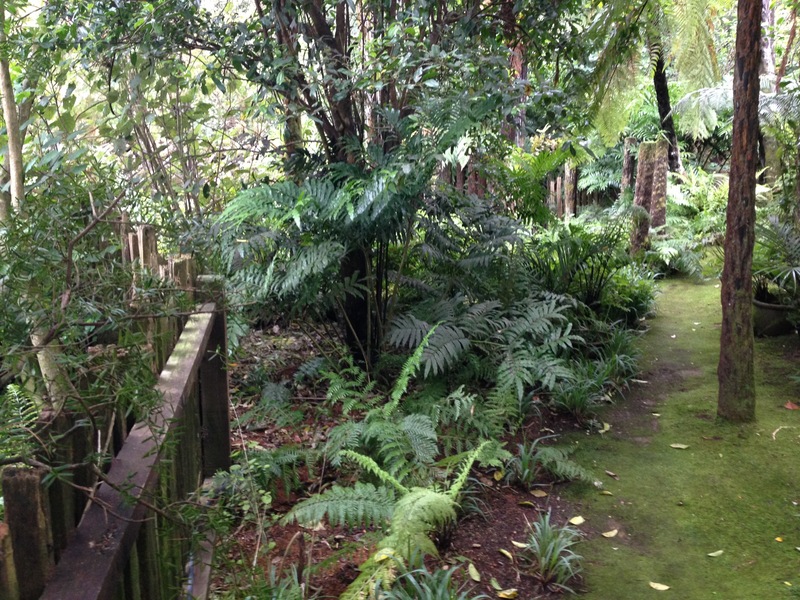 Every inch of the garden is alive, even the meandering pathways. You can see here how close the house is to the boundary line – but have you ever seen such a verdant side passageway before?! The design of the house is extremely clever too. Valda and David call it a ‘posh hut’ but nothing was left to chance with its design. They specified the number and size of the rooms they wanted and ensured there was not an inch more stolen from the garden. The house sinks into the sloping land, almost looking as though it grew up from the ground many centuries ago and the combination of clay bricks and timber works perfectly. 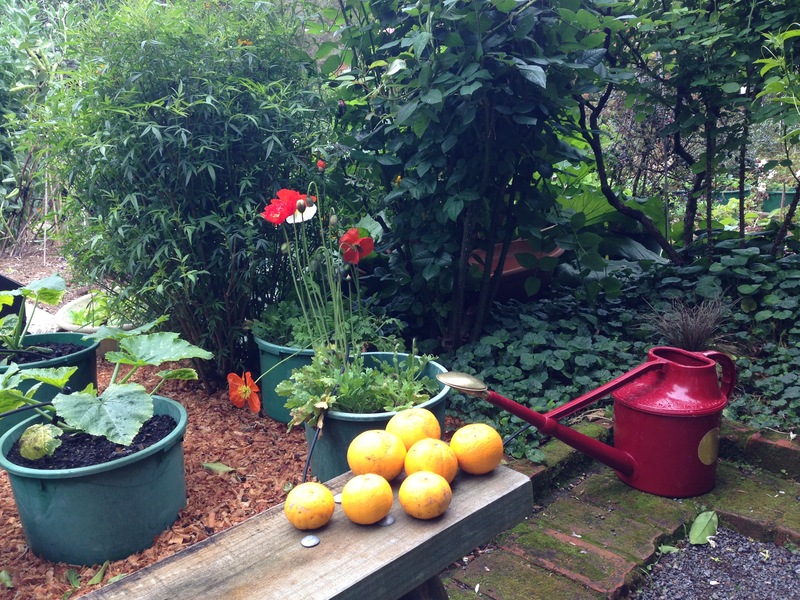 It is beautiful and yet subservient to the garden. Most would have run a mile from this block of land – positioned on a steep slope with a spring running through it. But Valda and David knew exactly what they were doing and used these features to their very great advantage. They seem to have managed to turn all possible negatives into positives – the one dark, submerged room in the house is a cricket ball-proof playroom. Ingenuis! 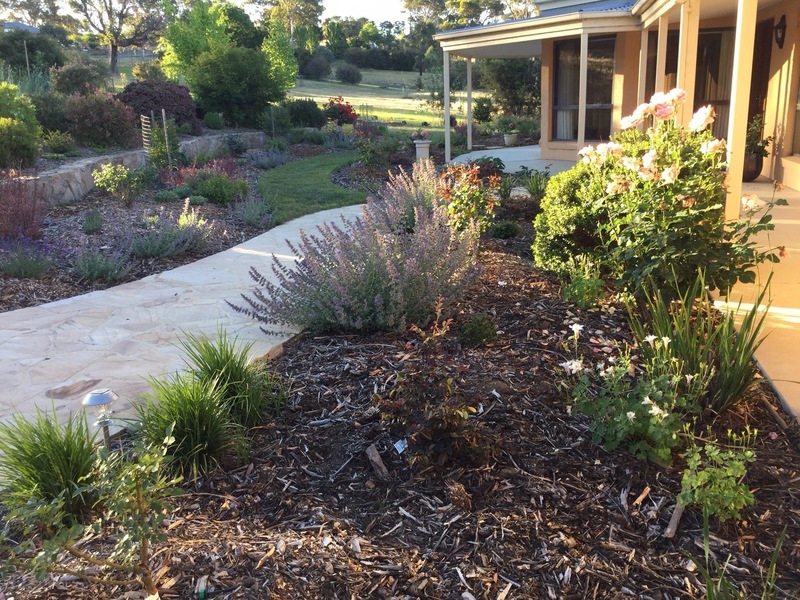 Whilst the overriding feel of the garden is of intricate and outstandingly spectacular native bushland, there has been no attempt to be purist with the planting. 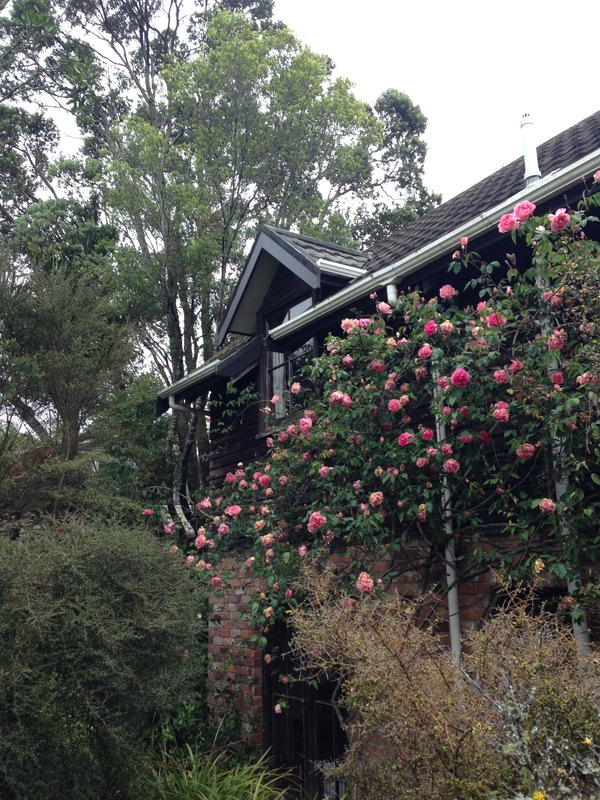 A stunning pink rose adorns the house and fruit and vegetables of all types grow on the sunny bank. Each and every plant has been added with immense thought and care and yet at no point has the overriding design been allowed to constrain their wishes. Valda and David are so skilful they find ways of integrating everything they want whilst each addition adds rather than subtracts from the whole. If I hadn’t seen it with my own eyes I would never have believed it. 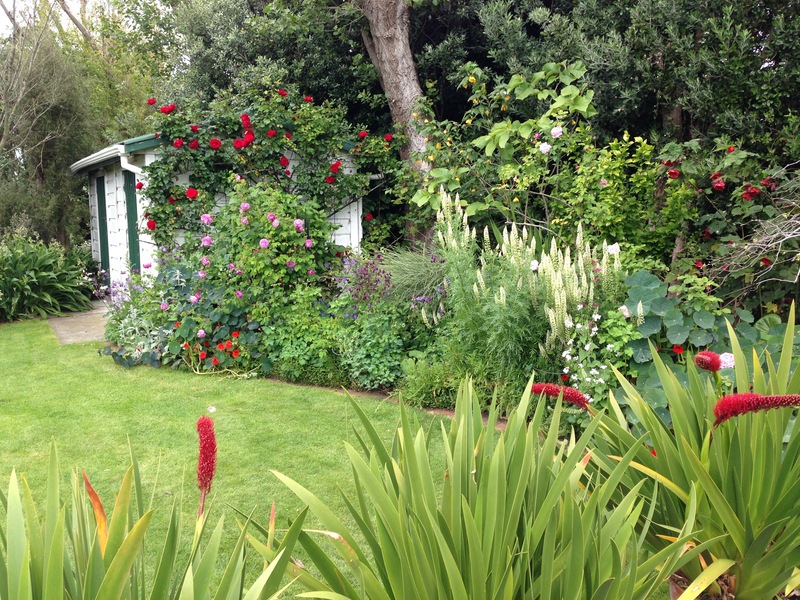 This is one very, very special garden. 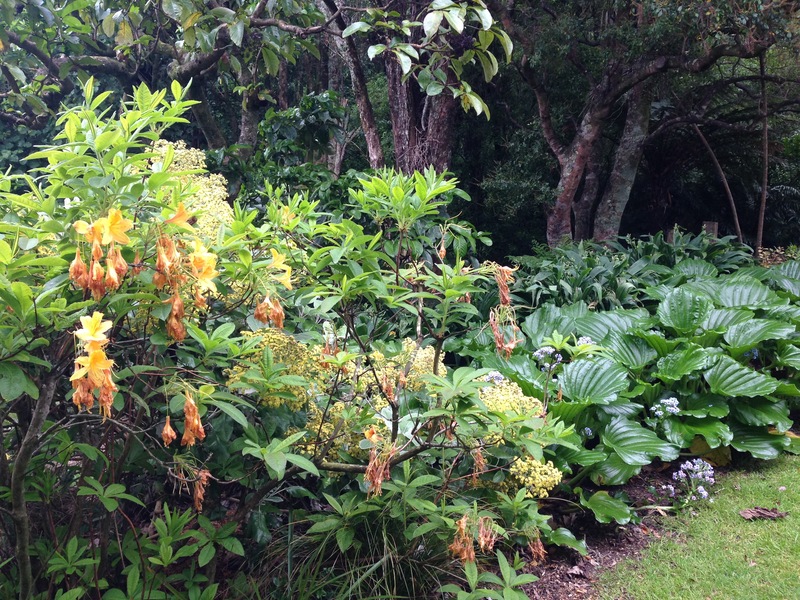 Lush colours at Te Kainga Marire. 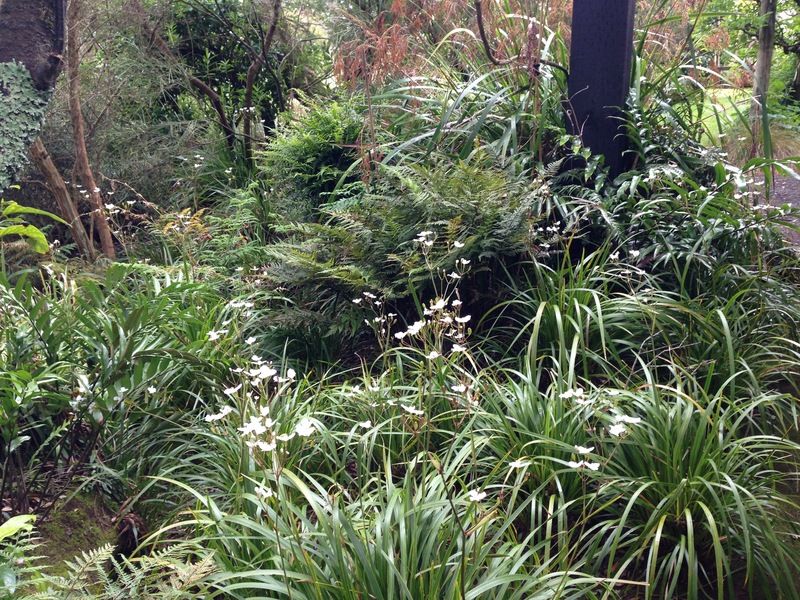 A drab native garden, this is not! What an amazing place and how lucky you were to see it Janna! I want a Xeronema callistemon! Just found out it takes 10 years to flower! I was lucky! My guess is that Xeronema only takes ten years from seed. They were flowering in many gardens so it seems probable that it is easy to divide and have instant flowers. They are really stunning plants. Watch out for them in other gardens I review! 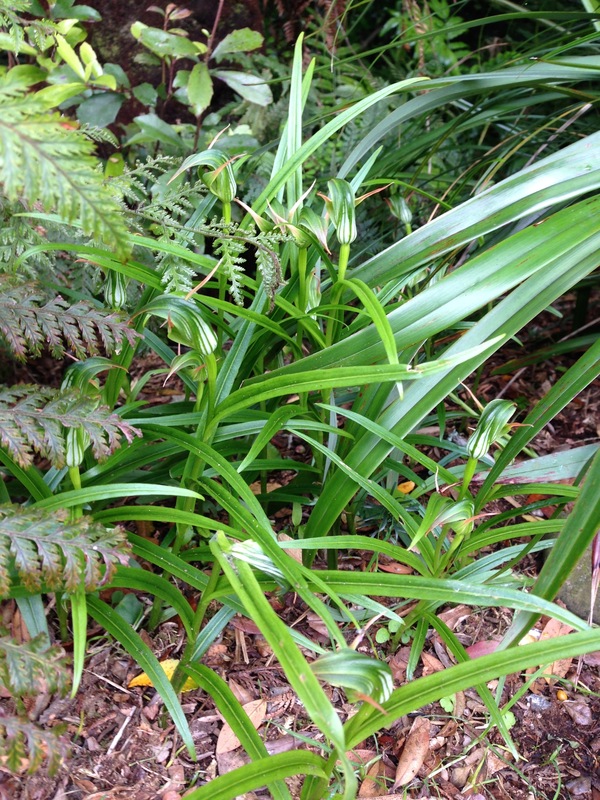 I’ve got one – it took 5 years – then I finally got one flower spike and was so excited my family thought I’d gone mad. Oh, I think it is a sure sign of being a good plants woman when they think you are mad!